Is Your Lawyer Radically Transparent? 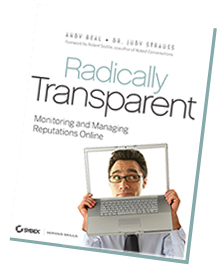 Radically Transparent is a new book by Andy Beal and Dr. Judy Strauss which explores the issue of online reputation. It used to be time consuming and difficult to put a bead on someone’s reputation. You actually had to talk to someone they knew. Today, unlocking someone’s reputation means simply hopping online and firing up a search engine. Accordingly to the authors of Radically Transparent, one third of Americans have voiced their opinion about a product or service online. For the past several years, savvy service providers, like lawyers, have been taking charge of their reputations, writing blogs, addressing comments and monitoring the web for any sign of client discontent. Taking the reins of one’s own reputation and addressing client issues before they catch fire is the most critical element of radical transparency. This is a far cry from the service providers of old. It used to be that one or two bad clients out of maybe a thousand did not matter; it was merely the price of doing business. Today, however, that one client can destroy a reputation overnight. Beal and Strauss examine the case of Kyptonite locks. Virtually overnight one user, posting one video of how to pick Kyptonite locks with a BIC pen undermined consumer trust the company had taken decades to build. By identifying the problem early and taking immediate action, Kryptonite was able to get new locks in the hands of nearly half a million customers, turning a public relations nightmare into a reputation building experience. Are You Hiring a Business or a Lawyer? How do you select the right lawyer? A good start is to search online for lawyers in your city specializing in the particular area of law you need. Did you find the name of a business or the name of an actual lawyer? Which one are you looking to hire? Every firm has good lawyers and bad lawyers. Which one are you going to get? Do not take chances. Hire the lawyer, not the law firm. Once you have some names, do a little research. Unlike the yellow pages, where the only additional information you can find is what the lawyer paid extra to have you read, an internet search reveals everything anyone has ever written online about the lawyer. While the lawyer’s website will provide a lot of solid background information, it is not going to provide much in the way of reputation. Using the lawyer’s website alone, you might just get the impression that he or she is the best lawyer in the world. Look for things other people are saying about the lawyer. What do clients and customers think of the lawyer? Do a Google Blog search. Does the media think the lawyer is worth quoting? Search Google News. What do online gurus think of the lawyer? Check Technorati. What do the lawyer’s peers think of him or her? Check out the attorney’s peer review rating on www.Martindale.com. Most importantly, how transparent is the attorney? Does anything on the web look like it was actually written by the lawyer, or does most of it look like sanitized fluff courtesy of the lawyer’s public relations firm? Based upon what the lawyer has written, does he or she seem knowledgeable? honest? open? Does the lawyer address issues in clear, concise language, the way you would like your issues addressed? Does the lawyer provide plenty of free online information relating to your legal issues? Why Choose a Transparent Lawyer? Radically Transparent lawyers run the risk of exposing too much. The more open they are online, the more likely you are to find out something about them you do not like. So why do they do it? Most radically transparent lawyers have found that the quality of clients they do receive as a result of their transparency, far outweigh the clients they lose. More importantly, it is far better to avoid a potential personality conflict before the relationship begins than six months down the road. While choosing a lawyer you feel comfortable with online is no guarantee of face to face success, it sure beats merely relying on your fingers to do the walking. Posted in Events. Tagged with Iowa, public relations.